Honker Pig knew spring was coming. It was time for his final test on earth. He checked his wings were clean and working, and reminded himself he had to pass the test with flying colours if he was ever going to get the book of knowledge that he wanted so badly. Honker Pig knew spring was coming. It was time for his final test on earth. He checked his wings were clean and working, and reminded himself he had to pass the test with flying colours if he was ever going to get the book of knowledge that he wanted so badly. “The adventures of Honker Pig take us deep into the realms of imagination and fantasy, yet touch a chord of truth that shapes this ordinary reality in which we dwell. Children of all ages will find valuable teachings in this story, one that should be read slowly and savoured.” Dr. Steven Farmer, Author of Earth Magic and Animal Spirit Guides Helen Davidson was born in Durham to an English father and Flemish mother, they raised Helen to love all animals and respect nature. Helen was a loner as a child and spent most days with nature, animals and her dreams-Helen trusted her dreams completely, she knew ,even at an early age, sometimes her dreams were an extension of what was to come! Having been a successful woman in the oil industry and knowing the time was right to finally live her dream Helen spent her spare time with wild animals straying in and out of her grounds day and night-interacting with and gaining their trust, pheasants, badgers, rabbits, birds even foxes mingled together somehow knowing this wasn’t the place to come to harm each other. 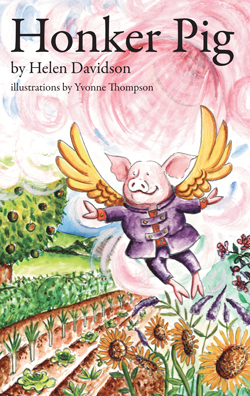 Be the first to review “Honker Pig – Helen Davidson” Click here to cancel reply.